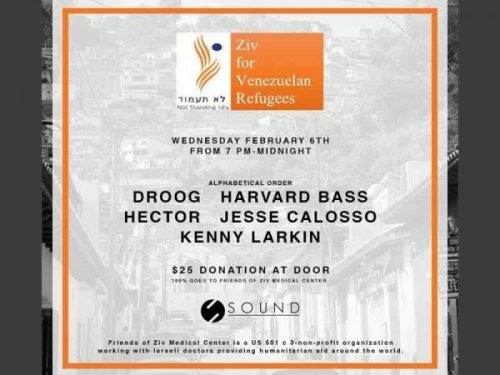 Friends of Ziv, Sound Nightclub, and Ziv Medical Center announce a humanitarian campaign: Ziv for Venezuelan Refugees to provide vaccines, medicines, and teams of experienced Israeli doctors to support hospitals and health-care personnel in countries bordering Venezuela. Friends of Ziv Medical Center, Sound Nightclub in Hollywood, and Ziv Medical Center announce their humanitarian campaign: “Ziv for Venezuelan Refugees” to provide vaccines, medicines, and send teams of experienced Israeli doctors to support hospitals and health-care personnel in countries bordering Venezuela that are providing medical assistance to Venezuelan refugees. Every week, thousands of Venezuelans cross Venezuela’s borders seeking medical attention and medicines that are not available in their country. The Brazilian health system has been overwhelmed by the demand of so many people with many health problems. Due to the lack of vaccinations in Venezuela, a series of epidemics are rampant in the country and many of the people seeking help have these diseases. The most widespread is measles, with several thousand cases so far, causing at least 12 deaths. Israel’s Ziv Medical Center is sending a team of doctors from to Brazil’s Northern Province, near the border with Venezuela. Ziv’s doctors have the expertise to tackle the situation and bring relief and support, even if temporarily, to their Brazilian counterparts. Kobi Danan, Sound Nightclub owner, has donated the venue and several well-known DJs – who will dance the philanthropic, caring crowd off their feet – are donating their performance for an evening of music and fun. For the sake of the plight of Venezuelans, the Ziv for Venezuelan Refugees campaign invites members of the public to participate. Tickets are available for $27.00 at the door. Attendees must be 21 or older. The Ziv for Venezuelan Refugees campaign was started by the Friends of Ziv Medical Center organization. The Friends of Ziv Medical Center, Inc. is a charitable organization run by volunteers to help the process of upgrading the medical services Ziv Medical Center offers to the community of northern Israel by fundraising for its capital and equipment projects and supporting its humanitarian work. Founded in 2014 under the initiative of Dr. Raul Rosenthal who served as the organization’s first president, Friends of Ziv has been headed since February 2016 by Rabbi Moshe Pitchon, a member of the founding board of directors. Friends of Ziv Medical Center has launched a series of programs and activities to create awareness about the vital work performed by Ziv Medical Center in Israel and other countries.